Keerava is an Argonian innkeeper in the city of Riften. She tends The Bee and Barb alongside Talen-Jei. Although she has a bed and a room in the inn, she never sleeps and is found behind the bar almost every moment of every day. She wears some barkeep clothes and some shoes. She wields a leveled dagger, which can be up to elven quality, and carries a selection of common loot and gold, a key to her inn, and her own key. Maramal: "People of Riften, heed my words. The return of the dragons is not mere coincidence. This is one of the signs. The signs that Lady Mara is displeased with your constant inebriation. Put down your flagons filled with your vile liquids and embrace the teachings of the handmaiden of Kyne." Keerava: "No, no... Maramal... we talked about this. Talen..."
Maramal: "Keerava, certainly we can come to an understanding. These people must be made aware of the chaos they've sown." Talen: "Enough, Maramal. We've all heard of the dragons and their return. There's no need to use them as an excuse to harass our customers." Maramal: "Very well, Talen. I'll remove myself from this den of iniquity." Talen: "We're not kicking you out, just keep the sermons at the temple and let us all sin in peace." She seems in desperate need of coin, saying, "I can't stand this city. It's impossible to make a decent living here." or "If you've got the coin, you're welcome here. Otherwise, hit the road." or "If you've got the coin, you've come to the right place. Pull up a seat." She also often checks up on you, saying, "What can I get you? Mead? Wine?" or "Looking for a place to stay?" If you ask her where you can learn more about magic, she'll point you in the right direction, "Head north to Winterhold. There's a College there, they teach magic. Most Nords don't care for them. Else you could go see the Jarl's wizard. Might be able to help you." If you're looking for Esbern she'll try to help, saying, "Never heard of anybody like that. But if you want to hide out in Riften, the Ratway's where you'd be. There's a sort of tavern down there, the Ragged Flagon. Where all the lowlifes in Riften get drunk and knife each other. You might try there, if you can get through the Ratway alive." When you give her a temple pamphlet, she'll say, "Look, the only religion I believe in is the good old septim. Everything else is just a waste." When asked what the word is around town, she'll have plenty of things to say about Riften, "Riften's biggest exports used to be fishing and honey, until the Black-Briar family moved in. Now the meadery is the biggest game in town. ", "The city guard has been tearing Riften apart looking for the source of our skooma problem. I'd hate to be in their shoes if they get discovered. ", "Sibbi Black-Briar is furious that his ex-lover tried to murder him. He's leaving no stone unturned searching for her. ", "Mjoll the Lioness used to adventure across Skyrim before she settled down in Riften. I hear it all ended when she lost her enchanted blade. ", "If Maven Black-Briar keeps raising prices on mead, I'll have to resort to watering it down just to make ends meet. ", or "If it's true that the dragons have returned, what will it mean for all of us? Is this how it all ends?" If the Thieves Guild is still on hard times, she'll say, "The Thieves Guild has been pushing hard to regain a foothold in this city. Rumor has it they're falling apart from the inside." If they're back on their feet, she'll say, "Crime is at an all-time high in this city thanks to the Thieves Guild. Don't we have enough problems with the war going on?" When you approach her for coin, she'll have some different greetings, "Here for a room or something to drink? Show me some coin first." or "You want something or not?" When you tell her you have a message from Brynjolf, she'll say, "I'll already told that buffoon I'm not paying you people a single coin!" When you tell her it wasn't a request, she'll keep her attitude, "Look around you, I'm barely keeping this rathole together. The war's seen to that." If you give up, saying this was a waste of time, she'll agree, saying, "Good, and take this little message back to your bosses. I'm not paying any of you a single septim... ever! Now get out of my inn!" If you try to brawl to get the cash off her, she'll be completely up for it, "Come on, give it your best shot!" When you beat her she'll plea, "Please, stop! I'll pay! Take it!" 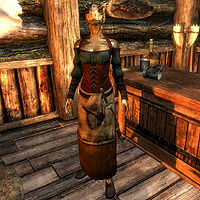 If you take a different route, as suggested by Brynjolf, and talk to Talen first, she'll be surprised when you bring up her family in Morrowind, "How could you possibly know about... Please. My family means too much to me. Don't hurt them." When you tell her to pay up this time, she'll be willing, "Very well. Here. Take this back to Brynjolf and tell him he'll have no more trouble from me." If you have already visited the other two merchants, she'll immediately hand over the cash, saying, "Look, everything was all just a misunderstanding. I didn't mean to tell Brynjolf to go jump off the pier. You'll tell him I said sorry, yes? Take this. Every single coin I owe is there, I swear it." Talen: "Keerava, we're running low on Black-Briar Mead." Talen: "We could always look for another brand." Keerava: "Don't worry, the time will come when we can walk away from here." Talen: "I hope so. I can't stand this city anymore." Keerava: "Damn it, Talen. We still don't have enough this year to get out of Riften." Keerava: "Talen, do you believe what they're saying? Do you really think the dragons have returned?" Talen: "I don't know what to believe. If it's true, then dark times may be upon us." Keerava: "What should we do?" Talen: "We hold each other close and hope that all of this ends well." This page was last modified on 19 September 2013, at 00:37.